Santa, Stinger, Student Activities Director Jason Boring, Binghamton Police Officer Chris Marshall and SUNY Broome students with the donations to Toys for Tots following the 2018 Giving of the Toys. Sometimes Santa needs a little help. Enter SUNY Broome students, faculty and staff, who pitched in for SUNY Broome’s 22nd annual Giving of the Toys. The campus holiday tradition benefits Broome County Toys for Tots, run by area police departments since 1962. The program distributes presents to more than 4,000 children and families each year. Bicycles, a giant stuffed penguin, musical instruments from the newly-formed Rock and Metal Club, chemistry kits from the CLT Club, and several giant boxes that took several elves to lift to the stage – all foretold a wonderful Christmas for area children in need. As is tradition, SUNY Broome’s athletics teams turned out in force to donate the tools of their trade: basketballs, armfuls of volleyballs, child-size tennis rackets and more, along with a mix of other toys. “It really gets me in touch with the holiday spirit,” said Hornets volleyball team member McKenzi Donahue. “You feel good about yourself,” nodded teammate Paige Taylor. Departments and offices across campus were in on the charitable action, some going for a wide selection of items and others focusing on themes specific to their area. Often on the road himself, SUNY Broome President Kevin Drumm went for a transportation theme, donating a remote control car and airplane. The cutest gift-givers, as always, were the children from BC Center, the campus daycare center, who tentatively gave their gifts to Santa and Stinger. 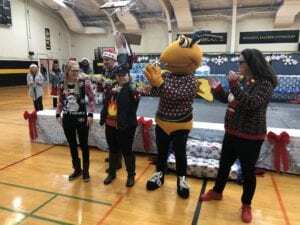 The event also featured an ugly sweater contest, refreshments, and performances by the SUNY Broome Choir, A Capella group and American Sign Language Club. Morgan Osborne and Jillian Percival, Nursing students from the evening and weekend program, lugged two sacks full of goodies: games, dolls, ponies, air hockey and more. “In the field, we’re going to be able to give back to the community. This gives us a chance to start early,” said Morgan, who was serious contender in the ugly sweater contest, in a confection that featured tinsel and bulbs.